If you’ve been wondering about the differences between Margin and Markup and how to calculate those figures, this is the article for you! We’ll explore the relationship between cost, price, markup, and margins. Margin vs. markup: what’s the difference? How do we calculate them? It starts with deciding on how to price your products (which is a big deal!). How you price your goods will depend on whether you buy your products in bulk, or if you buy them from different vendors at differing prices. However, once you have a system in place to figure out the cost (a.k.a. cost of goods sold or your purchase price), you can use cost to calculate your price. This is where the concept of markup comes in. Depending on where you search, you can get differing answers for what markup is, and what it has to do with something called margin (or gross profit margin). If you’re wondering how to untangle that web of M-words and learn what the difference is between margin vs. markup, then you’ve come to the right place. If you’re one of the millions of people who takes to YouTube for quick tutorials, our Margin vs. Markup video has you covered! If you’d like a step by step breakdown of the formulas, read on! What is the markup formula? You can think of markup as the extra percentage that you charge your customers (on top of your cost). Now let’s make the example a little more concrete. Let’s say the cost for one of Archon Optical’s products, Zealot sunglasses, is set at $18. That $18 is how much it costs Archon Optical to create a single pair of the Zealot. They will then turn around and sell each Zealot for the price of $36. However, some businesses might set their prices based on a certain pre-defined markup percentage. They’d have the costs ready and have particular markup percentages in mind to help them calculate a price. Expressing markup as a percentage is useful because you can guarantee that you are generating a proportional amount of revenue for each item you sell, even as your cost fluctuates or increases. This means that the markups you set up at the beginning should scale well as your business grows. We’ll discuss this more when you’ve scrolled further down this page. What about margin vs. markup? Now that we’ve defined markup and how it helps you decide on a price, we should discuss the other other big M-Word: margin. The type of margin we’re discussing in this case is gross profit margin, which describes the profit that you earn on a product as a percentage of the selling price. What is the margin formula? The gross profit margin on Zealot sunglasses is $18 ($36 price – $18 cost), or you could say the margin is 50%. Expressed in this way, margin and markup are two different perspectives on the relationship between price and cost. Just like you could say: Maryan is taller than Thomas, or Thomas is shorter than Maryan. When should I use margin? When should I use markup? Markup is perfect for helping ensure that revenue is being generated on each sale. Markup is good for getting started because, as you are getting things set up, you are keenly aware of the costs for your business, and you’re still learning about the kind of revenue you can bring in through sales. As you get to know your business better and you start to look at reports on your sales, margin can be helpful for examining how much actual profit you’re making on each sale. The cost of manufacturing the Zealot may not always stay at $18 (actually, it definitely won’t!). So the wise staff at Archon Optical will want to make sure that their prices are always adjusted to reflect the increases in cost. This where the concept of fixed markup really comes in handy, because it can help you to automatically adjust your prices based on changed in cost. 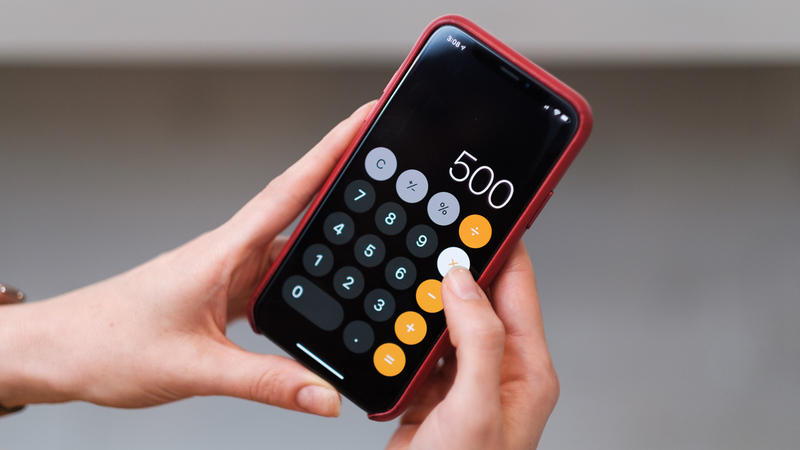 You could have cost and price as separate numbers that you input into your spreadsheet or inventory management software, but it’s much easier in the long run to have them linked. Defining your markup as a percentage above cost ensures that you continue to earn revenue on sales as costs increase, but it also means that you don’t have to keep automatically going back to adjust your pricing. Manually adjusting your prices based on cost is plausible for a smaller business, but this quickly becomes untenable as your inventory expands to include hundreds of items. If the Zealot becomes more expensive to produce over time, the price will have to go up, and gaining a markup of $18 on a $36 item is very different a markup of $18 on an item priced at $55. A fixed markup percentage would ensure that the earnings are always proportional to the price. What other factors affect markup? We’ve described markup very simply thus far because we’re assuming a scenario where Archon Optical makes the Zealot for a set cost and sells it at a set price, and that’s all there is to it. Of course, real life is a little more complicated than that. For each order of the Zealot, someone will have to be there to package and sell it. That’s a labor cost that’s likely broken down into an hourly wage. If you ship Zealot to customers in boxes or send them in trucks to stores around the city, you’ll also have to factor the cost of freight charges. Sending express or two-week shipping can make those costs vary wildly. Since the Zealot is a product that Archon Optical had to develop over time (it didn’t just materialize as a completed product), they need to account for all of the time and expertise that went into making sure that the Zealot was as as cool, aesthetically pleasing, and blocked as many of the sun’s harsh rays as possible. That product development time can also factor into cost. 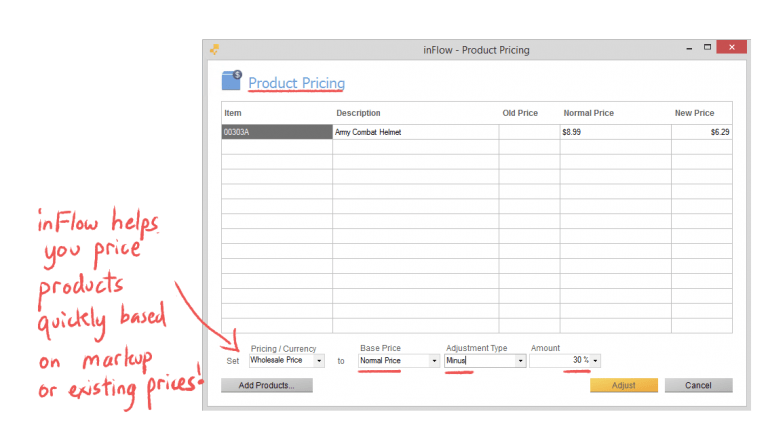 If your markup percentages change often, you can use inFlow’s Product Pricing feature to help you change prices for multiple products, with just a few clicks. Or if you’d like to automate some of your pricing, inFlow can set up a fixed markup percentage (e.g., always sell for 30% above cost) for your products. This guarantees that you’ll always make money on each sale, even as your costs change. You actually spell out the difference. Can you please do that? kindly help me convert mark- up into margin. I wouldn’t necessarily try converting one thing into the other. Instead, I’d find out the Price and Cost of a particular item, and calculate margin and markup from there. As long as you have those two variables, you can use the formulas in this post to find out either Margin or Markup. Thanks for your interesting article. If I have a range of products that I wish to receive a particular margin on (and it varies). Is there a formula for calculating the markup % to ga in a given margin. Ie 50% margin is 100% markup and 40% margin is 80% markup but 20% margin is 25% markup. What would 42% margin be for instance? That formula on that page can help you to find the margin when you only have the markup percentage, or vice versa. This very useful. Well explained, so simple to understand. Thomas, this is the best article I’ve read on the topic. You have a knack for teaching! Please keep doing what you’re doing. Thanks for the kind words and for stopping by, Kiara. I’m glad you found the article helpful! Well explained….simple and straight forward. Well if you’re reselling there are definitely some high value items, like laptops and cellphones, where it’s hard to make a markup of 100% because you’re already getting the products at a manufacturer markup, and consumers won’t buy the product for much more than that. In these cases, you can usually sell peripherals with a high markup value to help to make up for the loss in profits on the big ticket items. Considering the below what would be my selling price. my expenses are 15% of the current sales and my customer receive a discount on every invoice about 20% (which varies customer by customer). I would like to have a net 15% margin of profits. should I work my prices based on the above markup formula and how or should I work in the margin formula and how. for e.g my cost for a product A is 7. what would be my selling price to get 15% net margin with the above details. Price = -7 / (0.15-1), which is a price of 8.23. For margin this formula seems to only apply when the margin is less than 100%. What if you have a product you want to sell for more than 100% margin? And what if you want to maintain the margin over time. For example I have an apple that I buy for $0.68. Today, I sell it for $2.00. If the cost goes up to $1.10 tomorrow and I want to maintain the same margin (not markup) how do I do that? Hi Adam! I had a colleague on the QA team help with this so that it’s easier to follow the math. That same formula in the post can apply to the example you’d written out. 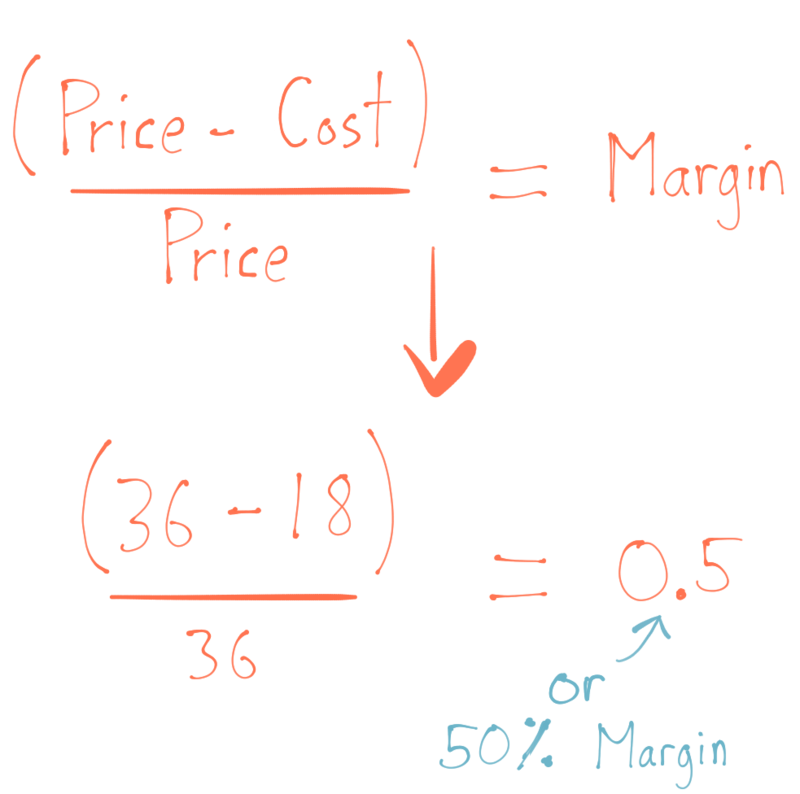 Let’s just rearrange the margin formula so it’s (Price – Cost) / Price = Margin. Using your cost of $0.68 and price of $2.00, that’s a 0.66 margin (66%). Knowing that, you can rearrange that formula above to solve for X (the new price). So $3.24 your new price to preserve a 66% margin on $1.10 cost. Been confused for years with the margin markup. This is the best explanation ever. I will never forget it again! How do you calculate the mark-up percentage backwards from the GP percentage? I think that post should answer your question! Hi Jef, sorry, inFlow doesn’t currently add pictures to printed documents/orders. However I’ve just recorded your feedback with our team and we’ll let you know if we change this in the future! Hi. Is there a formula were you can get a higher percentage of accuracy in your gross profit if you have different mark up? Ex. You have a hundred different types of products and a mark up from 10%-100% in them. How can you get the proper gross profit without a POS system. Hi ClifftonKim, we don’t have a formula for this specifically, but rather this is the kind of thing an inventory management system like inFlow Cloud can help with. Because our software can track the profit and COGS on every single sale, it’s easy to run a report on exactly how much gross profit you made over a given period of time, and which products contributed to it the most. We’ve also got a dashboard that shows your Top 5 products, so you can view them without ever having to run a specific report. i want markup details plz help 1 % markup= ? Hi Muhammed, sorry, I think there might be a misunderstanding here. You’ll usually need two out of three numbers, and then you can use them to figure out the third number. So if you have price and cost, you can figure out the markup. Or if you have the markup and cost, you can figure out the price. Thanks a lot to clarifying! It was really simple and of a great help to my experience. For the first time in my career life I got the core meaning of a markup and know the difference between it and the margin. If the cost of an item is $14.97 and I sell it for $35.38, the profit is $20.41. I have other items with different costs but I want to maintain the same percentage margin as the first item. It could be that I’m getting confused between percentage margin and percentage markup. It sounds like you want to keep the *markup* fixed across those items, since the numbers you provided represent the cost. 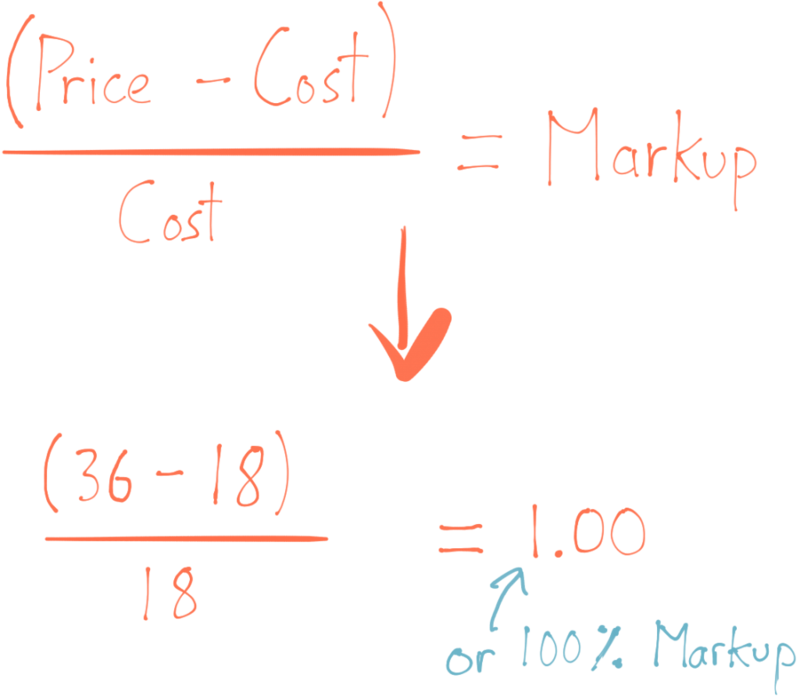 One easy way to think about it is markup is based on cost, while margin is based on price. For the example above, if you use the markup formula with a price of $35.38 and a cost of $14.97, you’ll get a markup of 136.34%. So that means you’re setting the price 136.34% above the cost. If you’d like to maintain that for the other products, you’d just be adding 136.34% on top of each of their costs. You can then apply the same math to the other costs you mentioned. I’m not familiar with the term TL, but if that’s the price, then you can plug those numbers into the margin formula like this. That would be a ~69% margin. By definition, the markup percentage calculation is cost X markup percentage. Then add that to the original unit cost to arrive at the sales price. The markup equation or markup formula is given below in several different formats.